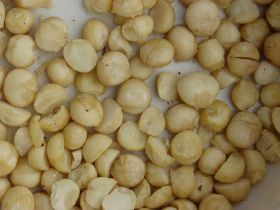 The “clean and green” origin of Australian macadamias is the focal point of a new Chinese consumer marketing campaign launched earlier this week. Developed by the Australian Macadamia Society (AMS) and several of the sector’s leading commercial marketers, the A$1m (US$723,000) project marks one of the largest promotional spends the industry has embarked on. The investment is well justified according to Australian trade and investment minister, Andrew Robb, who spoke at the campaign’s launch events in Shanghai and Guangzhou via video link. More than 100 guests attended the two launch events, including representatives from major Chinese retailers and a large cross section of Australian macadamia industry’s suppliers, exporters and growers. The campaign will focus on growing the attention of Chinese consumers via a mix of social media, advertising, television and newsletters. Particular attention will be paid to heightening demand around key occasions such as Chinese New Year. The campaigns launch was the culmination of almost two years of research and programme development from the Australian industry. “We have developed a cracking opportunity to showcase our global sensation to Chinese consumers,” says AMS market development manager Lynne Ziehlke. The Chinese campaign will borrow from recent promotional pushes in Japan, South Korea and Taiwan, which have proven to be successful according to Ziehlke. The Australian industry’s standing in the People’s republic has already been bolstered by the signing of a memorandum of understanding between the AMS and the Yunnan Macadamia Society, while the elimination of a 24 per cent tariff will also benefit suppliers once the China –Australia free trade agreement (FTA) is ratified. “This (FTA) will provide a strong competitive advantage for the industry and make Australian macadamias more affordable for Chinese consumers, who are quickly developing a taste for Australia’s clean green premium produce,” Robb said.